Listening to the new Horisont record “Second Assault” is an adventure in time travel. You don’t simply listen to the record, you hurdle backwards towards it. I am in a darkened, smoke-filled bar. Twenty or so spectators in different states of inebriation hoot and howl arhythmically as the band spews molten rock’n’roll. Half the crowd looks like Popeye Doyle, the other half look like Tuesday Weld. A poorly dressed, ratty haired bunch of skinny kids reach into their chests and pull out their guts in the quixotic attempt to find a higher plane if even for a moment. Their suffering is ours. It’s an imperfect fantasy, mostly because of the smoke. That itchy, uncomfortable feeling of unfamiliar scum clouding your vision. Not knowing whether to choke or sneeze. Somehow it doesn’t matter and it does. Rock’n’roll itself comes with a bit of discomfort. Loving it is a masochistic pursuit. Horisont gets that in spades. They explode everywhere, like a wayward roman candle knocked on its side. They are dangerous, blistering and blood-fanged; they are the sweat in your eyes and the exhaustion of endless impossibility. The 70’s reek of old carpet and cheap cologne. The food isn’t nearly as good, the beer is almost always flat and no one seems to have air conditioning. The world was a dark and foreboding place. Nearly every worthwhile movie of the era ended with the protagonist getting his or her head blown off and the great forces of evil crushing the spirit of the individual. Hope seemed ridiculous. As they marched to the hangman, they wore a gallows cool on their sleeve that those living in the airbrushed, cleaner than clean, hyper polished new frontier no nothing of. Horisont belongs there and not here. When I hit play, I am there with them. Occasionally, I hear a record where song titles don’t matter to me. I don’t want to know what the tune is about, where it was recorded or who produced it. I could care less about the album art and knowing the town where the band started playing is simply an annoyance. I just want to hear the music. Again and again. When the album completes its long-winding journey to nowhere, I can think of nothing but finding the button that will make it start all over again. 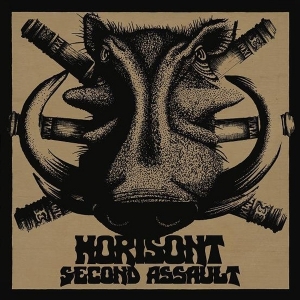 For me, Horisont “Second Assault” is that type of album. This entry was posted on April 2, 2012, 11:29 PM and is filed under Pointless Music Reviews. You can follow any responses to this entry through RSS 2.0. You can leave a response, or trackback from your own site. after reading this, i still don’t know exactly what kind of music Horisont plays… but now i feel as though i have to look them up. good job sir, well played. Thanks! It was meant to be more of an accompanying piece than a review. Glad that came across! They are worth checking out for sure.